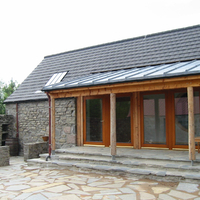 The refurbishment & repair of Invererne Steading. 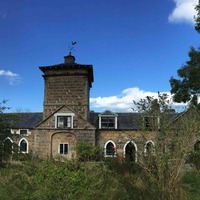 The buildings are Historic Scotland Listed at "Grade B"and include the notable Doocot structure. Three existing farm cottages within the complex are to be refurbished, with the feasibility of the conversion of the remaining barns structures and outbuildings into new uses being explored. Repair & Renovation of Rear Range which forms ancillary accommodation to the Category “B” Listed Building of Greeshop House. Conversion of a traditional Aberdeenshire Steading group in to a single residence. Including the introduction of a raised clerestory to give additional head room to first floor. Replacement of derelict farm steading buildings with a new eco-dwelling designed to maintain the character of the existing steading building and forms while providing a contemporary, energy efficient and spacious house. All existing materials have been reclaimed and re-used on site. Conversion of steading buildings into Holiday Letting accommodation with Climbing Wall and Yoga Studio. 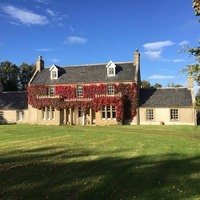 Conversion of steading buildings into up-market B&B letting accommodation designed around the needs of the Aberdeenshire Off-Shore businessman. 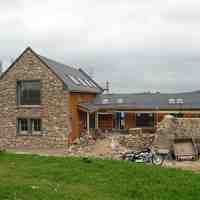 Repair, alterations & extension to a derelict Farm house outside Forres. New first floor accommodation and timber glazed extension to provide the open plan life-style for the modern family.